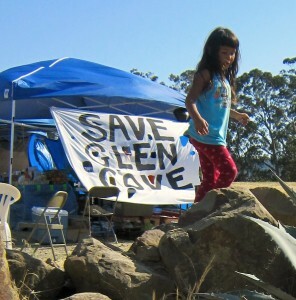 encampment at Glen Cove. Participants tended to the sacred fire and scrambled to secure tents and shade structures that were taking flight on exceptionally strong winds. 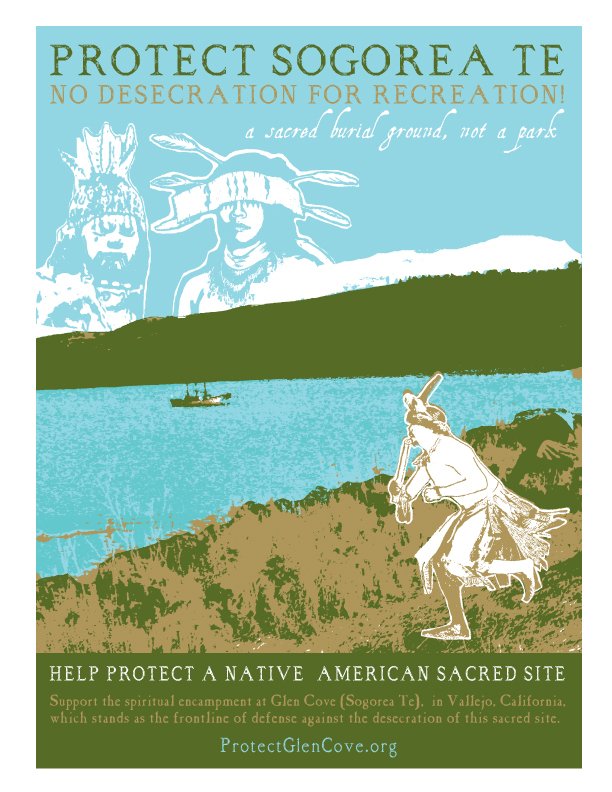 Rebelde artists’ group in Oakland has designed a 4-color "Protect Sogorea Te" poster. 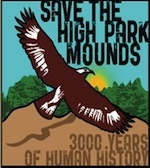 These posters will be screen-printed and sold as a benefit for the emergency defense fund. 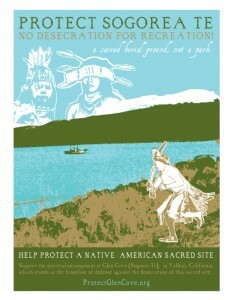 From dignidadrebelde.com: "Today marks the 50th day that a spiritual encampment (an on going prayer and presence on the land) has held strong in at Glen Cove, in Vallejo California… I created this graphic as a humble attempt to create a visual that captured the stories being told by organizers and elders. 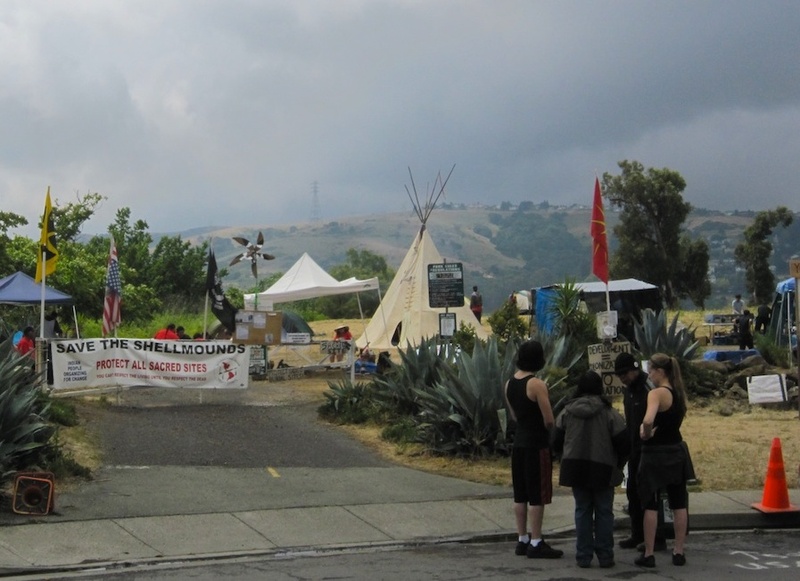 I wanted to depict the ancestors’ presence on this sacred shellmound and did so by depicting Miwok and Ohlone men and women reflected in the clouds and in on the land. Many other California peoples have been present on this sacred land I want to acknowledge that as well. 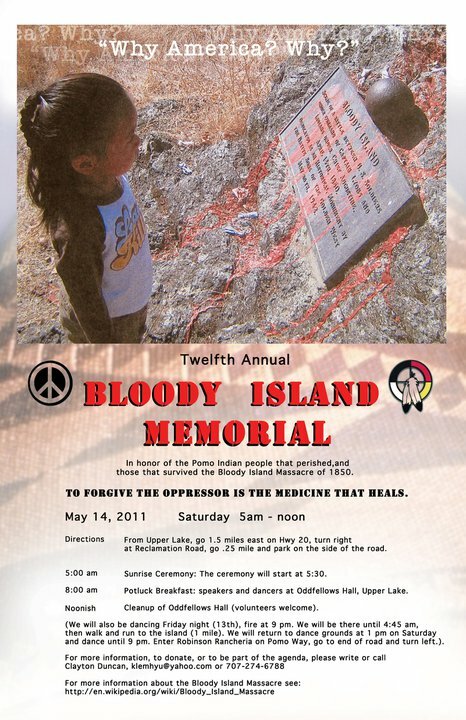 Ideally this could be a much larger piece that could reflect how important this site is to many, many, many peoples." participants in the ongoing ceremony at Glen Cove were inspired by an outpouring of community support in the form of many visitors, gifts of food and supplies, and cash donations. Over $800 has been raised since the request for donations we put out last Thursday. 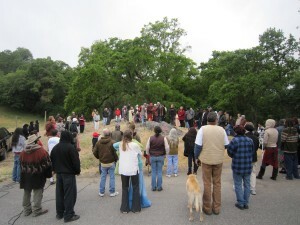 Our warmest thanks goes out to everyone who has been showing up and contributing. 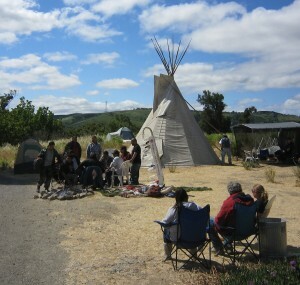 On Saturday the 28th, a know your rights and legal observation training was held on the land, hosted by attorneys from the National Lawyers Guild. 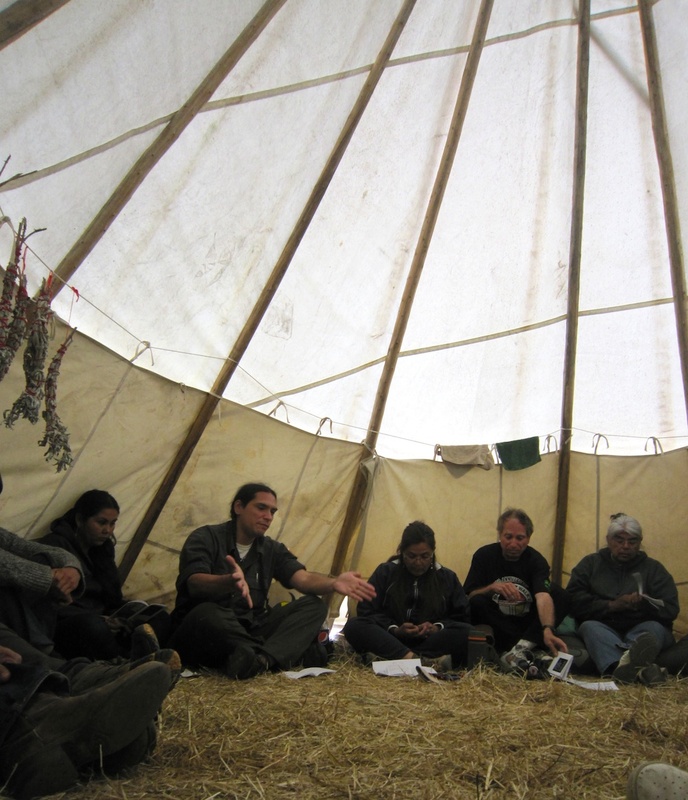 Later in the day, Mark Anquoe and Morning Star Gali of the International Indian Treaty Council held a 3 hour workshop and discussion at Sogorea Te, focused on the UN Declaration on the Rights of Indigenous Peoples. 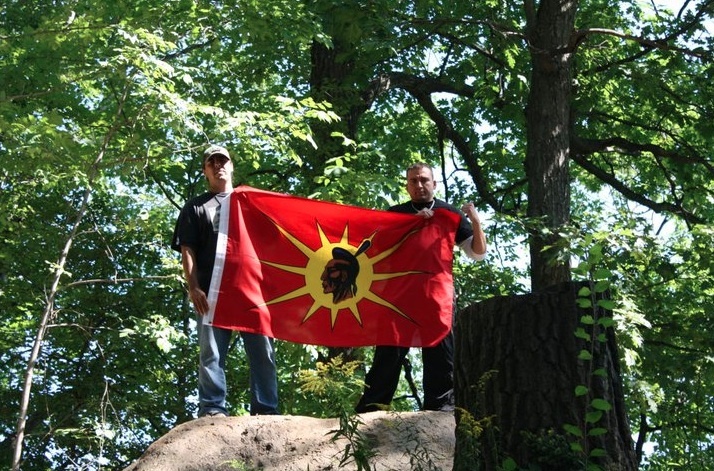 The discussion expanded to the topic of colonialism and how laws on various levels have shaped and enabled the continuing oppression of indigenous peoples. Treaty Council representatives explained that, significantly, the UN Declaration does not include any wording about “federally recognized” VS “unrecognized” tribes (such as the Ohlone), because “the power to define is the power to destroy”. 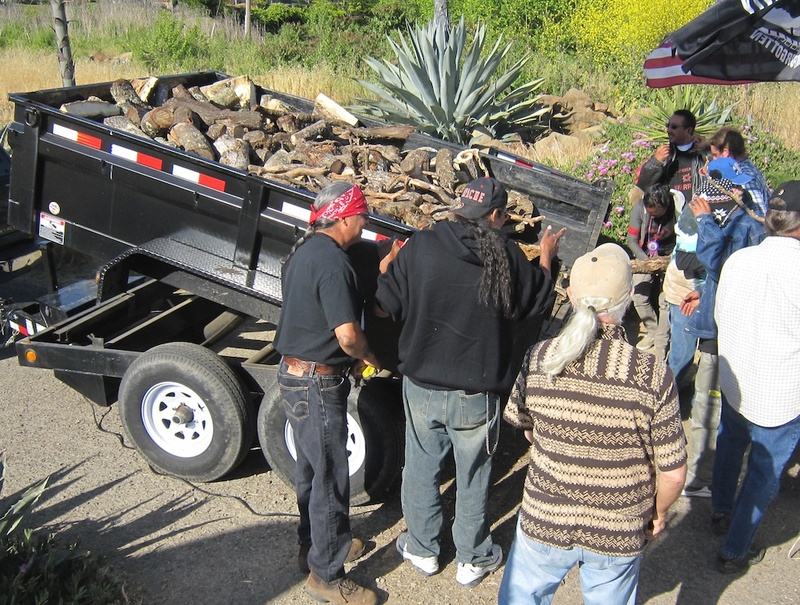 This new short film edited by Rebecca Ruiz-Lichter features clips from interviews with Corrina Gould (Karkin/Chochenyo Ohlone), Morning Star Gali (Pit River), Wounded Knee DeOcampo (Miwok) and Fred Short (Chippewa), interspersed with footage from the ongoing ceremony at Glen Cove. Pipes ready to be installed at the San Francisco Peaks to transport wastewater from Flagstaff for artificial snowmaking. 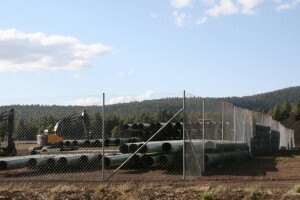 area have begun moving pipeline and construction equipment to the base of the holy San Francisco Peaks, located in Northern Arizona. 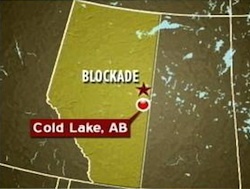 The Peaks are central to the ways of life of more than 13 Indigenous Nations. Snowbowl’s development plans include clear-cutting 74 acres of rare alpine habitat that is home to threatened species, making new runs and lifts, adding more parking lots and building a 14.8 mile buried pipeline to transport up to 180 million gallons (per season) of wastewater to make artificial snow on 205 acres. 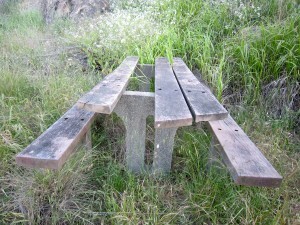 One of about a dozen delinquent picnic tables at Benicia State Recreation Area. GVRD plans to spend thousands for new picnic tables at Glen Cove, less the a mile to the west. of California’s 278 State Parks will be closed to public access next year, due to budget shortfalls. 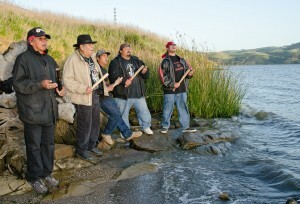 The Benicia State Recreation Area, located just to the east of Glen Cove on the Carquinez Strait, is one of the parks set to be closed, chosen in part because of under-utilization by the public. 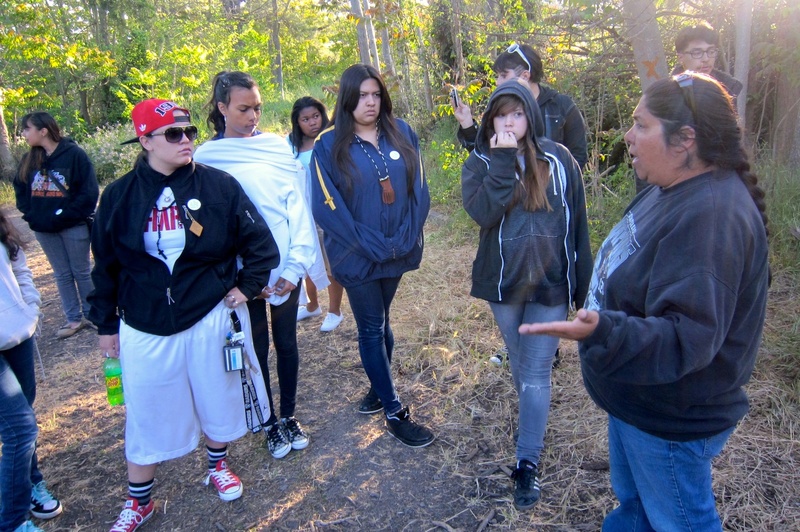 Meanwhile, over a million dollars of State and non-profit grant money is being directed by the Greater Vallejo Recreation District towards constructing a NEW waterfront park that will desecrate an area held sacred by Native Americans. A special strategy meeting was held at Sogorea Te today. 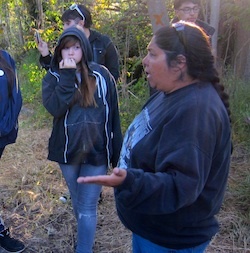 40 people from Vallejo and the greater Bay Area gathered to discuss next steps and possible actions to move things forward, given that GVRD is still refusing to engage with us. Many good ideas were raised, and tasks divided up. 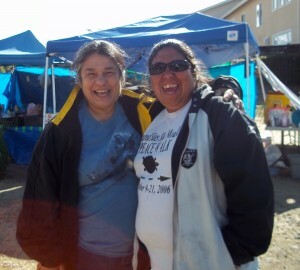 Women of the Sogorea Te spiritual encampment have begun holding womens’ circles, cultivating mutual support and addressing issues that arise from the imbalance of there being many more men than women in the spiritual encampment. 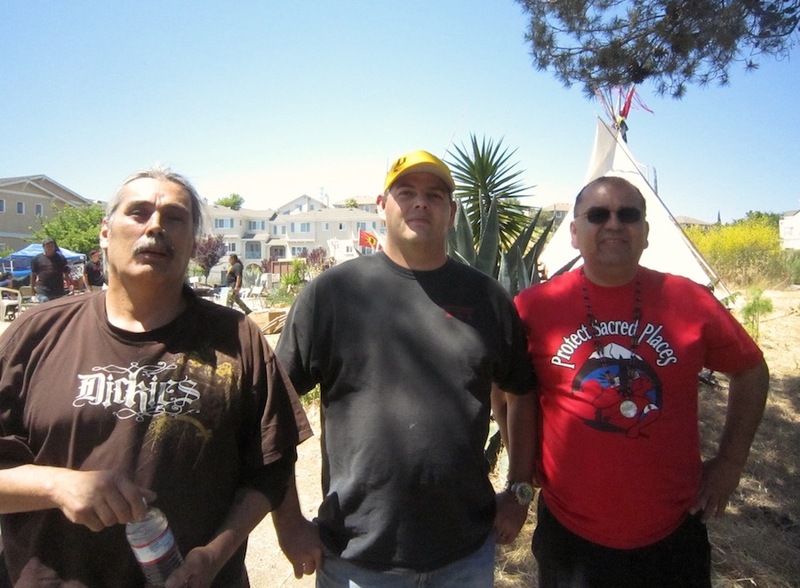 representatives drove down from Northern California, including Radley Davis of Advocates for the Protection of Sacred Places, Don and Jim Hayward of Redding Rancheria, Louis Gustafson, and Jonathan Riggins. 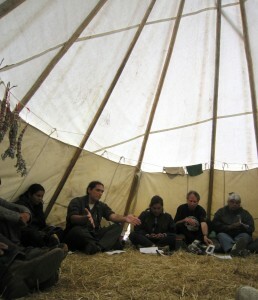 They brought a cord of beautiful fire-scorched Red Fir, told stories of their own experiences with protecting sacred places such as Medicine Lake, and shared traditional songs with elderberry clappers. 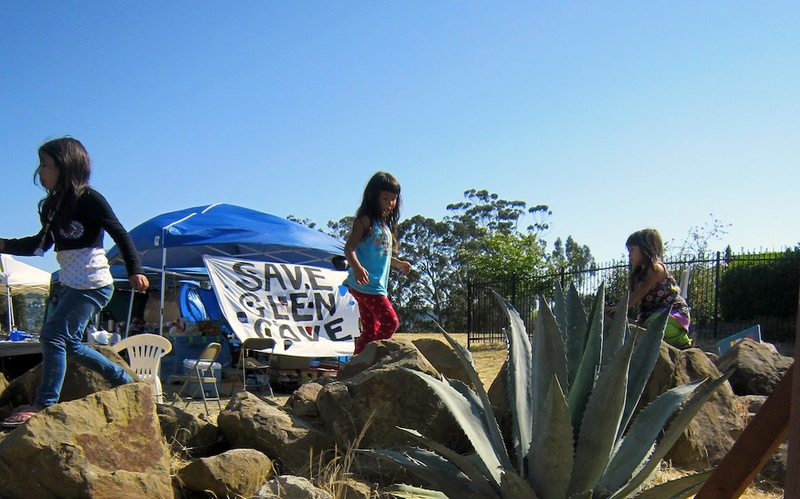 Redding Rancheria (Pit River/ Wintu/ Yana) recently passed a tribal resolution in support of protecting Glen Cove from the desecration of park development. We are writing to let you know that many hearts, spirits and prayers are with you from Ka Pae ʻĀina o Hawaiʻi, way out in Ka Moana Nui (the great Pacific Ocean). in unity with the heartbeat of your struggle from across the great vastness of sea that connects us all. May your works be blessed, now and for all future generations! Many elements of your sacred struggle resonate with us in Hawaiʻi. 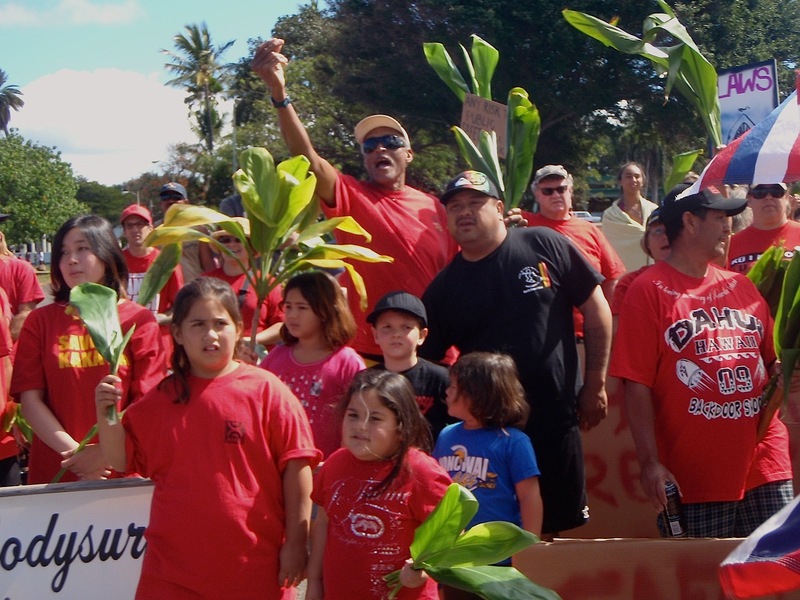 We have felt the pain of desecration and disrespect for native culture ourselves, and the Aloha ʻĀina, love for the land, that drives us to stand against this desecration extends to all of you as you make your stand. 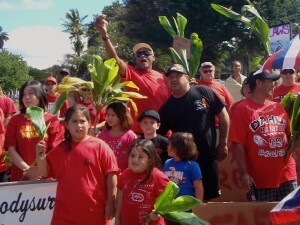 Sogorea Te – Moses Mix and Mahealani Keale (a folk song-writer), hailing from the islands of O‘ahu, Kaua‘i and Ni‘ihau. 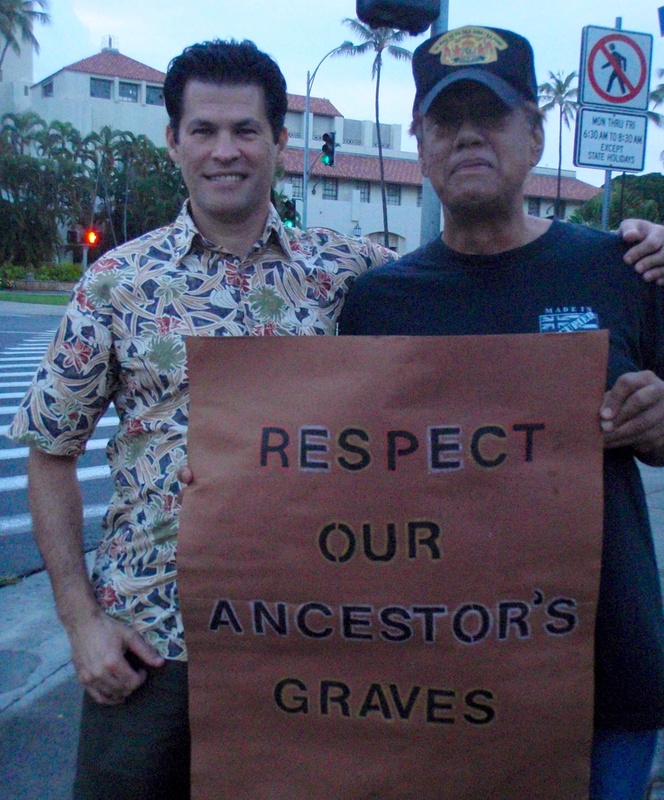 They shared a song and warmly commiserated with our struggle as they described some of their own work protecting burial and sacred sites in Hawai‘i. 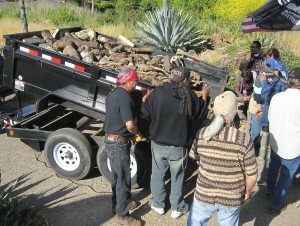 Another massive load of wood was donated yesterday. 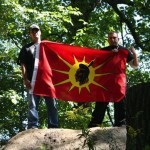 Dine’ traditionalists and lifelong advocates for the protection of sacred places, spent the day with us at Sogorea Te. They brought songs, prayers, and encouragement. 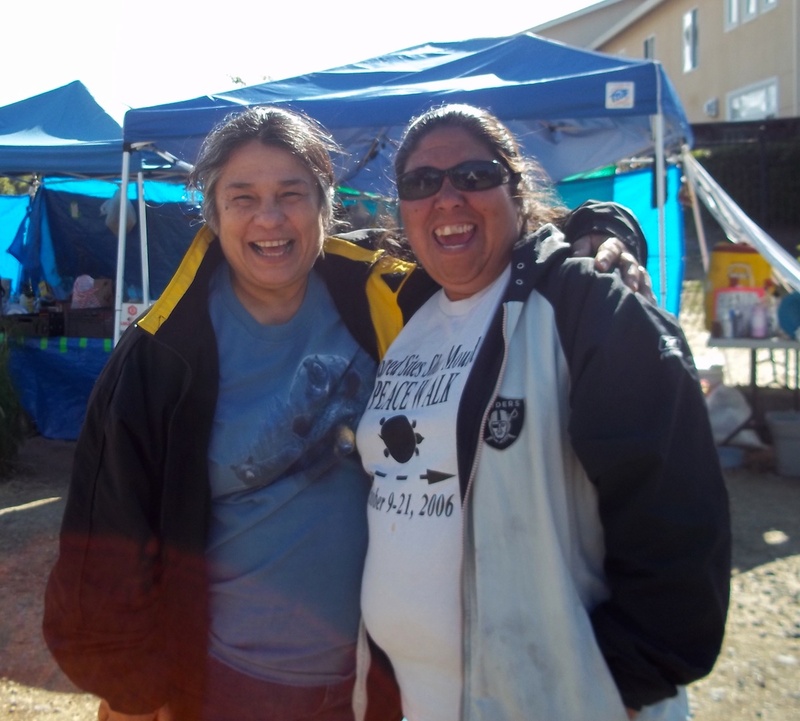 Corrina Gould and Wounded Knee DeOcampo spoke at Station 40 in San Francisco this evening to a packed crowd of about 80 people. They were accompanied by a group of singers from the spiritual encampment, who shared the Sogorea Te and AIM honoring songs. Q & A following the speakers was lively, and many young people offered various forms of support.